The selfie trend has officially gone too far. This time, it’s not even a person pressing the button to capture their mug over and over — it’s a cat. We thought the trend had gone too far when it was announced that more people died from taking selfies than from shark attacks in 2015 — or even when news broke that India has already had six selfie-related deaths this year (even though, alarmingly, we’re only 24 days into 2016). But no. This gray tabby, known on the Web as “Manny the Selfie” cat, tops that news (in a decidedly more cheerful way). The snap-happy pet learned to press the button on his owner’s Go Pro himself, and the rest is Instagram — and viral Internet — history. The truly funny thing about this kitty’s selfies? The angle, the expressions, the concentration are all so familiar from the thousands of selfies we’ve all seen that Manny looks almost human. Yorem Ahm, Manny’s owner, told ABC News that Manny is “probably the most intelligent, inquisitive cat we’ve ever had.” He and his wife have four dogs and four cats. 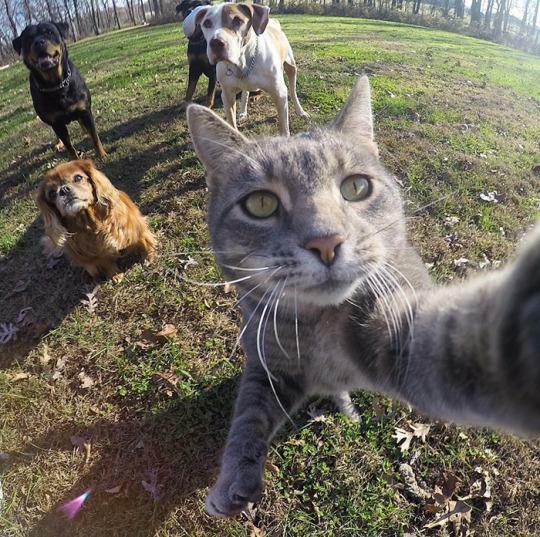 Manny is a rescued stray the couple took in two years ago — but based on the amazing selfies he shoots, he’s the alpha of the entire pet pack. Check out some of our favorites from Manny’s selfie series, or follow him and his animal gang on Instagram.com/Yoremahm.